Connect the VCC and GND pins to a 2.4V-5.5V power supply. The usage of the other pins depends on the operating mode selected. 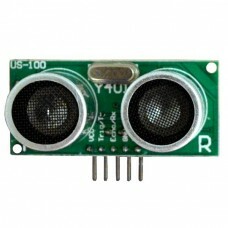 Select the operating mode of the US-100 Ultrasonic Distance Sensor by using the jumper on the back of the module. 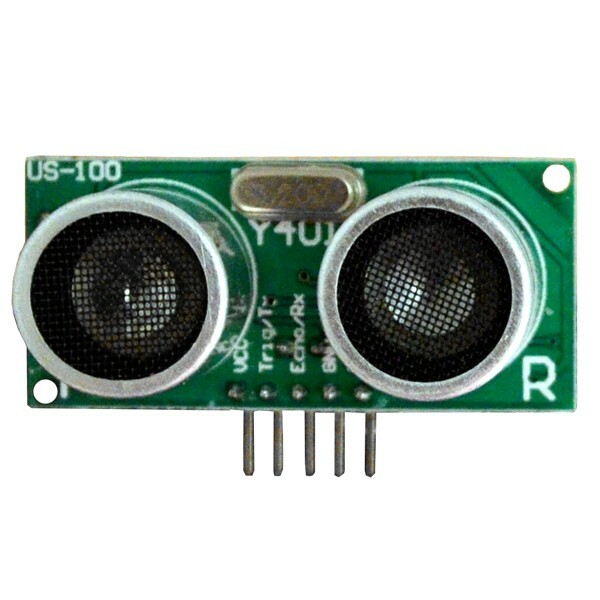 When the jumper is present, the sensor outputs the distance as binary serial data, otherwise the sensor outputs a single pulse that has a width which represents the distance measured. Place the shunt on the operating mode selection jumper to choose serial data mode. Attach the module to a serial port on your microcontroller. The Trig/TX pin connects to your microcontroller's TX serial transmit line. The Echo/RX pin connects to your microcontroller's RX serial receive line. Set the microcontroller's serial port to use 9600 baud at 8-N-1 (eight data bits, no parity, one stop bit).